"Ian McKellen, Judi Dench and John Woodvine (Banquo) lift themselves to levels of excellence seldom encountered on the small screen. Or anywhere else. Television is honoured by this Macbeth."  Herbert Kretzmer, Daily Mail, 5 January 1979. Two internationally acclaimed stars of screen and stage join forces to capture the powerful essence of one of Shakespeare's greatest plays, Macbeth. Sir Ian McKellen (Gods and Monsters) and Academy Award winner Dame Judi Dench (Shakespeare in Love) shared the stage in 1976 in Stratford-Upon-Avon's intimate "The Other Place" theatre. Here, in this smallest of Royal Shakespeare Company spaces, one of the finest theatrical directors of our time, Trevor Nunn (1996: Twelfth Night: Or What You Will) created a definitive production of Macbeth. An unforgettable experience for those who witnessed it, now this lost theatrical treasure is available for the first time on video, perfectly captured in all its murderous magnificence. 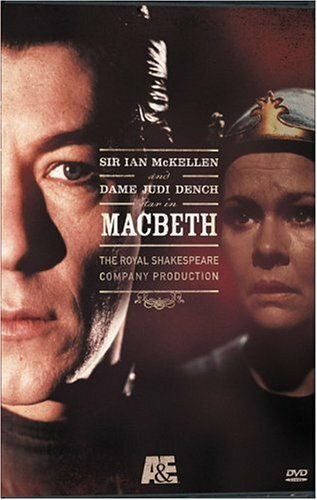 In this compelling production, McKellen and Dench are joined by an outstanding cast of Royal Shakespeare Company members that include Ian McDiarmid (Star Wars: Episode 1 - The Phantom Menace, Bob Peck (Jurassic Park), Roger Rees (A Midsummer Night's Dream), and John Woodvine (Persuasion). The director, Trevor Nunn, was the youngest ever Artistic Director of the Royal Shakespeare Company, which he ran until 1986. He has received the Tony Award for Best Director of a play or musical for his acclaimed production of Nicholas Nickleby, Cats, and Les Miserables. From the Three Witches until "Birnam Wood do come to Dunisane", this outstanding production of Macbeth commands attention from bloody opening to bloody finish.